Building a fire is one of those life experiences that you generally get to pick. You can choose to go camping. You can choose to have a fireplace. It is also one of those things that can come in handy when you least expect it. There have been a lot of bad storms these past few years--hurricanes, snow storms, tornadoes. You may find yourself without power and needing to start a fire to keep warm or cook food. You may never find yourself in this position but a little knowledge is not a bad thing. So here it is, the Things Every Goddess Should Know guide to making a fire that will catch and burn. First, you will need some kindling, some paper you can burn, some logs and either a match or a lighter. I like the long necked lighter that you just pull the little trigger. You want to make sure the wood is not wet. Wet wood smokes more than it burns and will not make much flame or heat. Crunch some paper into a few small balls--about four should do it. Arrange the paper on the bottom of the fireplace. Put a little pile of kindling on top of this pile of paper. (Kindling is just a fancy way of saying you want a lot of twigs or tiny branches.) Now take two or three logs. Arrange the logs so they are leaning against each other forming a little triangle or tepee over the kindling. You want to make sure there is room for air to flow freely around the logs. Next make sure your vent is fully open. You will need the circulating air to get the fire going. Light the paper and wait for it to catch the kindling. The paper will light quickly. The kindling a little more slowly. The kindling will then help the logs to catch. Once the logs catch, you will start to see a decent sized fire. 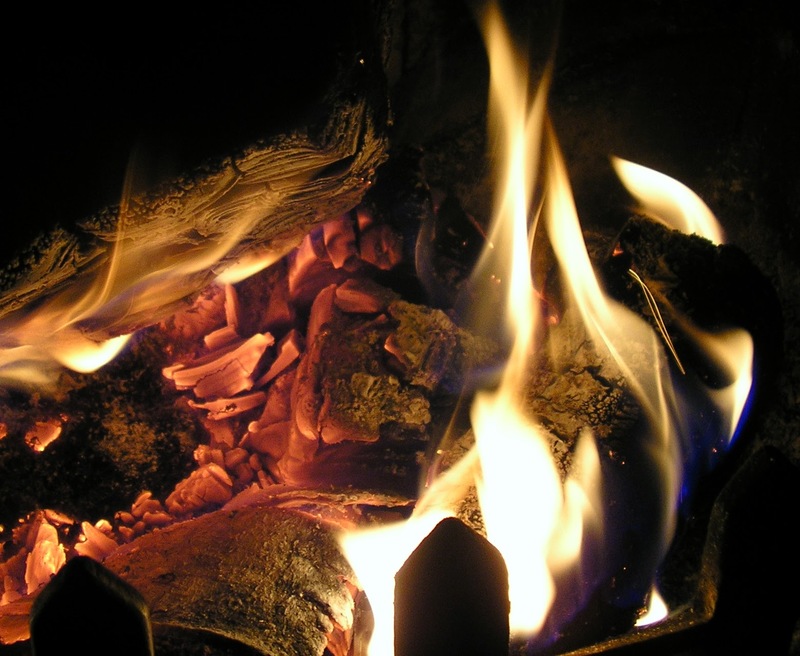 Give it a little time for the fire to heat up before closing the flue. If you close the vent and the fire starts to go right out, open it back up some and wait a few more minutes. You will get a sense of how long this takes for your fireplace once you have done it a few times. Once the fire is hot enough, you can close the vent all the way. You will need to add another log about every hour or so to keep the fire going. If you want, you can just let the fire burn out in the fireplace. If you want to try to save the coals to start another fire later, you will want to do something called banking the fire. Wait until the fire has burned down to a layer of hot pieces of wood that look like coal burning. Push it together and cover it with a thick layer of ash. Keep the vent closed. In the morning, you can push the ash gently aside and you should find some coals still burning. Add some logs, open the vent and it should flare up. If necessary, throw a little more paper in there. And voila, fire.